I began this post in July and stuck it in my drafts folder. But, since it examines value as well as jewelry design, I'm posting it now. While much jewelry is seasonless, some pieces say "summer", and extend basics like a navy tee, white shirt or camel sweater to three or four season wear. That's when an unabashed summer piece can be a wise buy. Today, choices for summer and beyond that cost less than a weekend away. 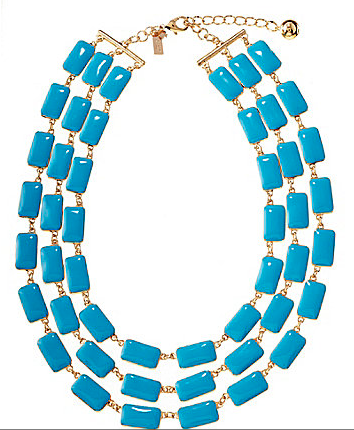 This Kate Spade Park Guell necklace was $228 online at Dillard's last summer. I liked the aqua, Palm-Beachy bib, the adult-sized scale and 18-inch length. I thought of buying it to dress up an LBD or white shirt, but with tax, that rolled up to $250, plus shipping and import duties. While unlikely to actually wear out, body oil, perfumes and lotions and sushi-sticky fingers would eventually attack the resin. "Well", you might say, "suppose I get 100 wears out of it, and so what?" I wouldn't disagree, especially if we were having a G&T on your deck, and you were wearing it becomingly. I don't believe all jewelry should be eternal, but what else could you get for, say $400 or less? 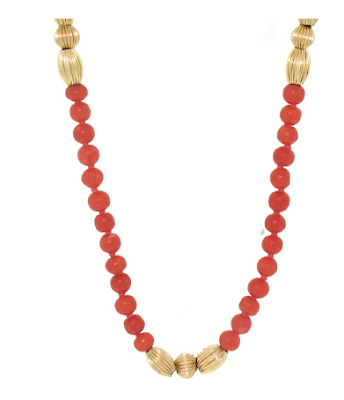 At Beladora2, we find a coral and 18k gold bead necklace, 20 inches long; price, $395! You don't have the coverage of a bib, but you get gorgeous glowing colour (coral looks wonderful on both dark and light skin) and the richness of 18k. If you have fab earrings, they can stand on their own, or you can supercharge the glam by adding rings and bracelets. The middle is indecisive. Your money may go farther, too, as earrings demand less material. 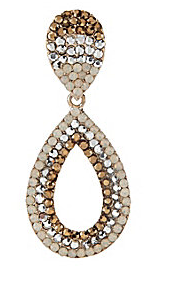 The Natasha Accessories Crystal Open Teardrop earrings (also at Dillards; price, $34) were a budget bargain. The classic and perfectly balanced design could pass muster, especially with a good watch and rings. (Mix genuine and costume, but only if you'd wear the items together if everything were real.) They also came in a sea-hued blue/green combo. Lose a stone, though, and they're not so appealing. 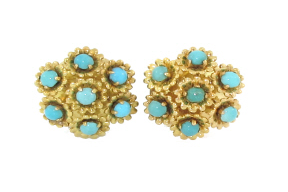 From Beladora2 again, vintage turquoise and 14k gold mid-century button earrings; 3/4 inches in diameter, a tad over our budget at $476– but they make my heart race. It's worth shaking the piggy bank for such treasures. 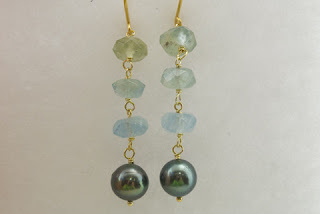 Here's another pair that you could make your year-round signature: aquamarine nuggets and 9mm Tahitian pearl earrings (price, $153 from Kojima Company). The aquas say summer, and the pearls are deep enough to carry the earring through winter. I'm always looking, learning and evaluating materials, workmanship and other factors I posted about here and here. Whether it's a mulit-carat precious gem or string of craft show beads, value is always on my mind. What's on my ears as I write? A $35 pair of 14mm white baroque pearl studs, bought on a whim on eBay from a Chinese vendor, which turned out to have flashing green and pink overtones. My jeweller admitted she would sell them for ten times the price. Pure luck, and I wish the same for you! Oh do send us the link for that chinese vendor! large almost gum ball sized fresh water pearls in cream, purple, teal and grey. Coral has fascinated me and I do love turquoise. You always source the best Duchesse! hostess: The highlighted text is the link. Enjoy your new pearls! I love the Kate Spade necklace. It was unavailable (also too pricey for my frugal little heart) but I found this one on sale at the Kate Spade website. I love the colors so I splurged on it for my birthday. You are an enabler! I like the coral necklace but not the price. wendelah: Good bargain, it's a pretty and interesting piece,d happy birthay! The Beladora coral necklace is another level-fine jewelry-and price is most reasonable given its quality. I obviously advocate genuine materials, though certainly do not make such purchases lightly or often. Oh, how I've muttered to myself over what wonderful pieces I could already own if I hadn't frittered away funds on costume jewelry, most of which I've passed on to my teen daughters. Not all-some pieces I still enjoy. But not nearly as much as my tried and true pearls, jade, and gold bangles. I've collected these from estate jewelers and (gasp) ebay, so the prices have been extremely reasonable. And, now I'm known for these pieces. I even celebrated my July birthday by purchasing a shorter strand of pearls that I can combine with my long strand, or wear more casually as they're about 17in long. Keep reminding folks of these good deals: they really ARE personal statement pieces. I love summery jewelry. My favorites are: sterling chain, sterling monogrammed cuff, ivory (old ivory) beads, a crazy fake turquoise necklace, an old carved medallion necklace in some kind of creamy white shell material, pearls, a mother of pearl and silver cuff, and more. Love wearing white and silver jewelry in the summer! Value. In many ways my Dries van Noten shift, wildly expensive, was a great value because I wear it All. The. Time. and every time I do a) someone says cute dress b) I feel secretly sophisticated. LPC: The cost-per-wear value proposition is a tricky one, as I have often used it to justify a pricey purchase and then it doesn't turn out that way. Gah! I flog myself over that. When it works, like your DVN dress, hooray- because you have both the beauty and the knowledge that you are really getting the wear out of it. I would wear that dress to the ground, too. I have a string of rather rough-cut turquoise beads my mum gave me years ago, but the unrelenting turquoise doesn't "go" somehow, and I certainly don't want to give that, or the similar corals, away. I'm going to have to study what other semi-precious stones can properly add interest and be a bit less pastel - I love those colours but I'm not a pastel person. As you probably know, there are several bead and jewellery supply shops on rue St-Hubert, north of Jean-Talon, that have semi-precious stones (and some ghastly junk) and silver beads and findings. I wear silver all year round, but some silver pieces are more "summery" than others. The first two pieces you show are the kind of things I find lovely but which would not suit me. I'd certainly be quick to compliment anyone I saw wearing them! You might be able to find crystal stones at costume jewellery supply places. lagatta: So much fun to find treasures at church or yard sales! Turquoise mixes wonderfully with so many semiprecious stones (or their imitations) list them: amethyst, onyx, the less-costly pearls and of course coral, but also wood, glass and silver. I recently saw a stunning piece created from repurposed turquoise beads, old Chinese coins, shells and bits of what I think was sandblasted glass chunks, strung on a black silk cord.